When you’re living in a city, the skies at night are fairly underwhelming. The shots you will get are the well lit buildings and bridges. A rare time you will find a place to shoot light trails from passing cars. Winnipeg has little traffic for light trails after dark. I’m not sure as to why, there is enough traffic, but perhaps not enough places from where to shoot that live traffic. 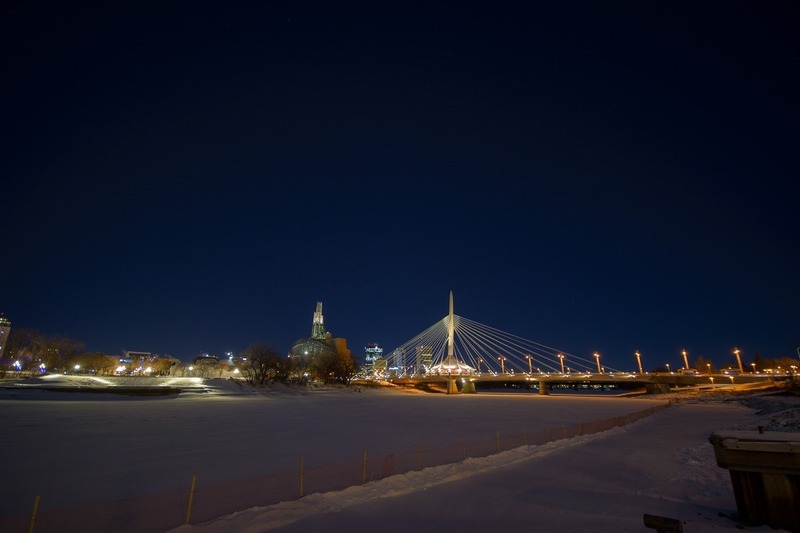 However you turn it, in Winnipeg one will end up shooting this bridge. It is now nearly world famous, in Manitoba. Shooting it in winter or summer makes little difference, as long as the skies are nice and clear. Sometimes, the sky over Winnipeg is lit up. Nice fireworks are hard to come by and in Winnipeg you get them at least twice a year. Once while it’s warm and once while you’re freezing to the ground. 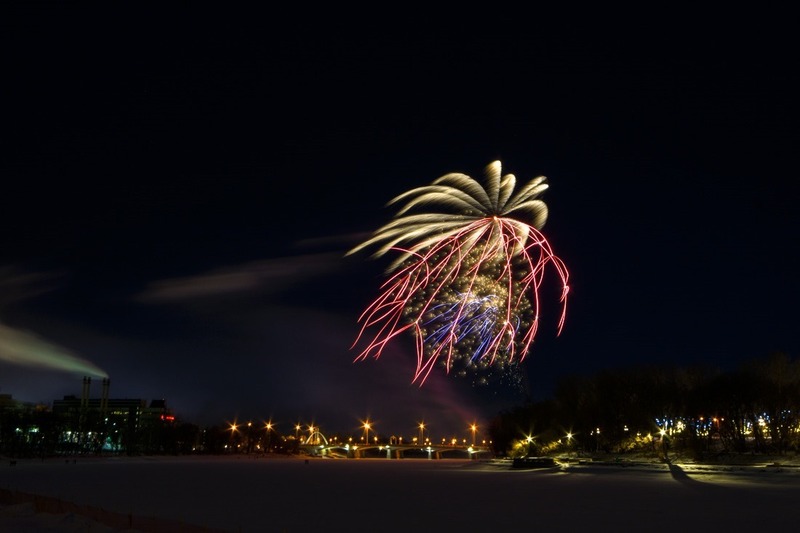 This year I missed out on Canada Day’s fireworks at The Forks. So the above shot is from New Year. Yep, one of those “freeze to the ground” shots . 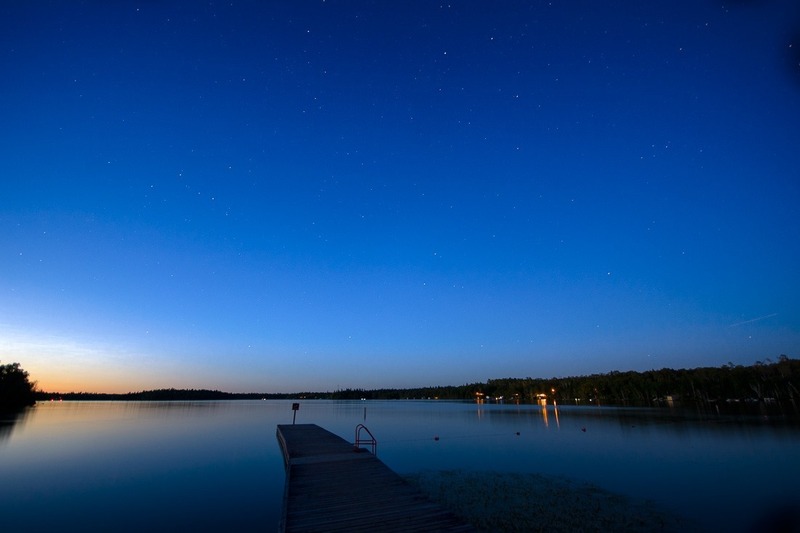 Once it gets warmer (a lot warmer) the night sky is different. The occasional thunderstorm over the city is a welcome change over the usually blank night skies. The above shot was taken over a period of about 75 seconds. No Photoshop magic or treatments here from me, other than an adjustment for white balance. Night skies in the city are too often a murky orange, thanks to the sodium lights used for the streets. 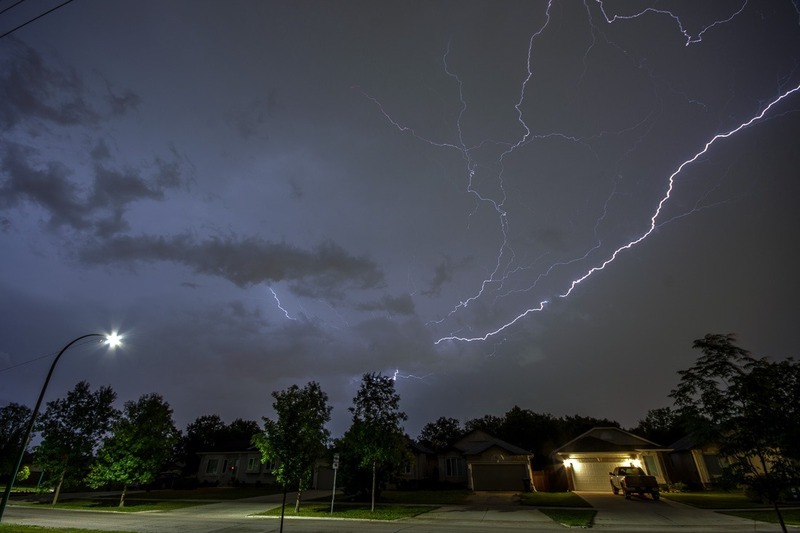 While Winnipeg has replaced many of the street lights with white LED lights, yard lights and private lights still cast that orange glow on all pictures taken in the night. 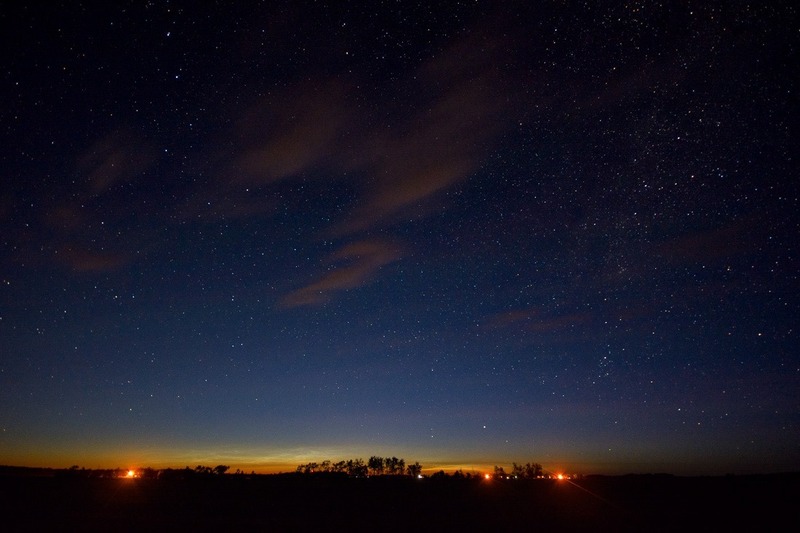 To avoid that orange glow or light pollution, you have to leave the city and move far away. 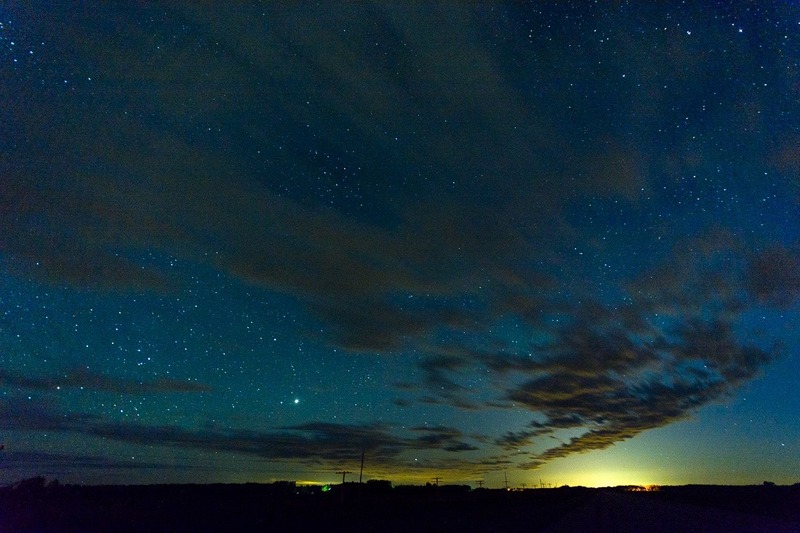 This picture was taken about 90 kilometres away from Winnipeg, facing the city. As you can see, even here, that light pollution is still present, although way less prominent. Going further away into the Whiteshell Provincial Park is then the only option to get rid of the pollution altogether. Here, the orange glow is from the all-natural sunset. In the top right corner of this picture is something that I dislike a lot. This was a mosquito, trying to find out if my lens was filled with blood or not. The lens was not, but my friend and I were. It didn’t take long for us to attract literally thousands of mosquitoes, thirsty for our blood. Now I know that I need to lose a few pounds, but I am not into forced blood-letting for that. We beat a hasty retreat after the hungry blood suckers had found us. A few shots and we were done. Off to a place that didn’t have as many insects. We didn’t want to drive 200 kilometres and take only three or four pictures. There had to be more of this. Back on Highway 15, not far away from Elma,MB, we stopped at the side of the road to simply enjoy the bug free night. The glow here is still the afterglow of the sunset, mixed with a few yard lights of the nearby farms. Then began the waiting time to see the Milky Way. First overhead, the Galactic view was faint and needed settings on my camera that were a bit too far out of range for good photos. High clouds were still illuminated by the setting sun, but this one was nice to see. After some more waiting and talking, we set up to shoot more. A nearby farm had a mercury type yard light, with a poisonous green colour to it. Far away was a thunderstorm that we decided not to chase. It would have taken hours to get close enough and possibly the storm would have tapered off by then. Better to shoot what we got at hand this time. 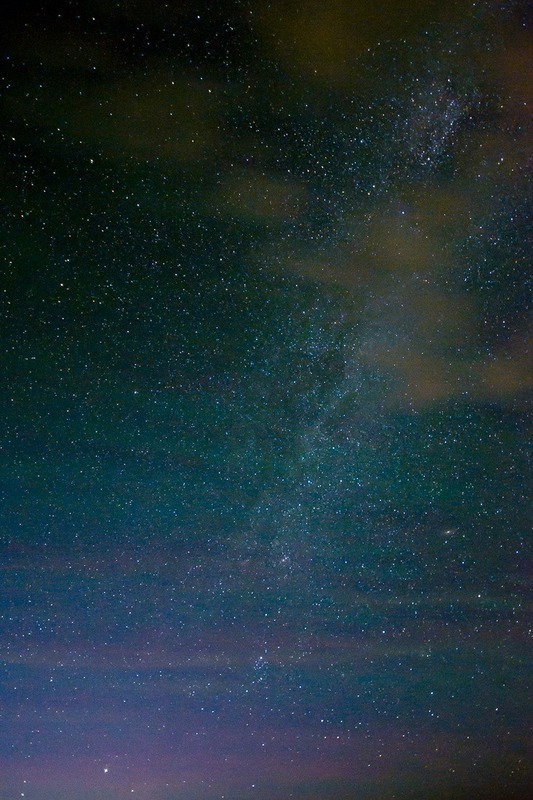 The further you get away from the cities, the better the night sky. 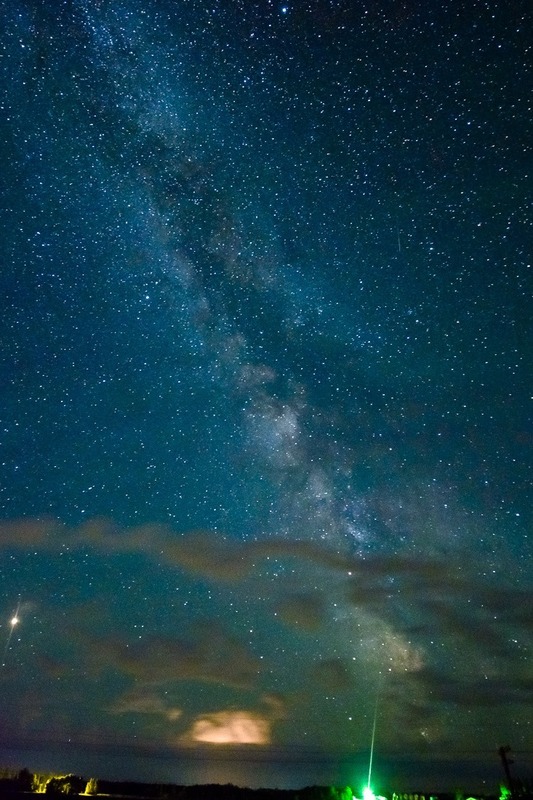 Coming from Europe, it had taken me many years before I first saw the Milky Way. City light pollution had always obscured it for me. By now, I am happy to take people to enjoy and photograph it whenever the skies are clear, that Milky Way is a gorgeous subject.